We had beautiful weather last week up here in Northern Ontario. Balmy twenty degrees (celsius) temperature and clear blue skies. 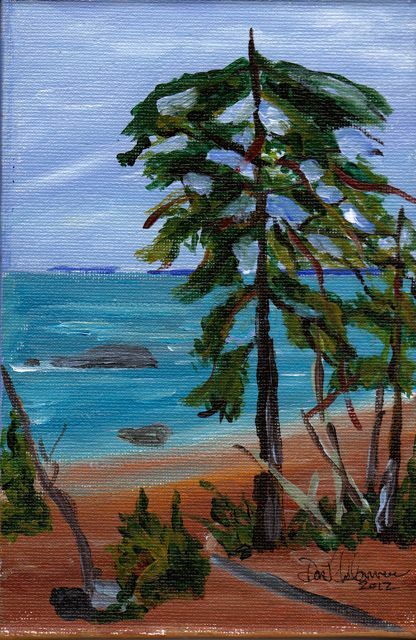 I decided to head down the highway to Katherine Cove, one of my favourite places on the Lake Superior coastline. I spent two days hiking and sketching and came back with some good stuff. The thing about working outside is getting the paint on the canvas before the light changes. That can happen pretty quickly on the Lake Superior shore line. A slight change in the wind and the water changes colour and the same things happens to the sky. At times the Lizard Islands seem just a short distance from shore and then they just sort of disappear in the water and seem to be miles away. It's just amazing how the atmosphere changes the perspective - there's power in this place filled with magic. These paintings of Katherine Cove were painted on sight. 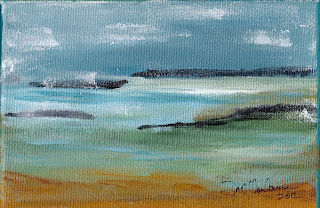 Some of the canvas is left exposed and minimum colours were used to express the simple beauty of this place. Title: White Pine / Katherine Cove "5x7" acrylic on canvas $85.00 includes shipping and my "Gitche Gumee Songs From the Lake" music cd. 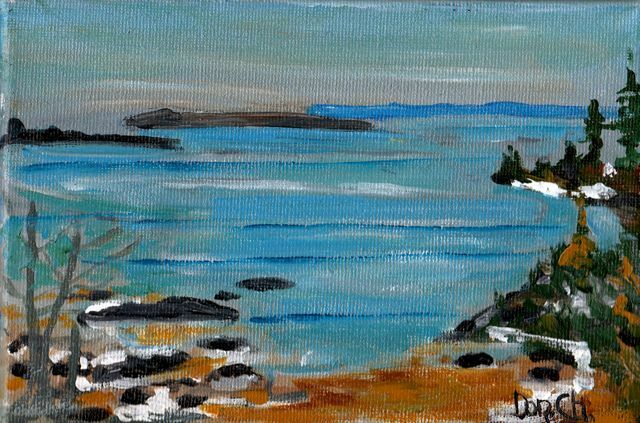 Title:"Fishing Boat / Katherine Cove ''8x10'' acrylic on canvas $135.00 includes shipping and my "Gitche Gumee Songs From the Lake" music cd. Title: "Dark Sky Over The Lizard Islands" 8x10" acrylic on canvas $135.00 includes shipping and my "Gitche Gumee Songs From The Lake" music cd. 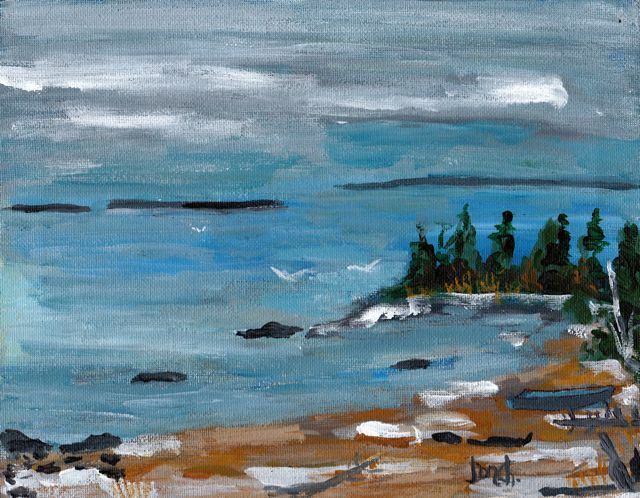 Title: "Early Spring / Katherine Cove" 5x7" acrylic on canvas $85.00 includes shipping and my "Gitche Gumee Songs From The Lake" music cd. 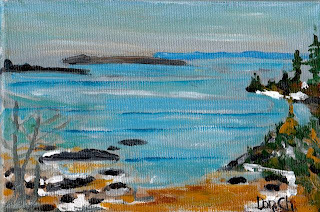 Status: Lizard Islands / Katherine Cove ''5x7" acrylic on canvas $85.00 includes shipping and my "Gitche Gumee Songs From the Lake" cd. 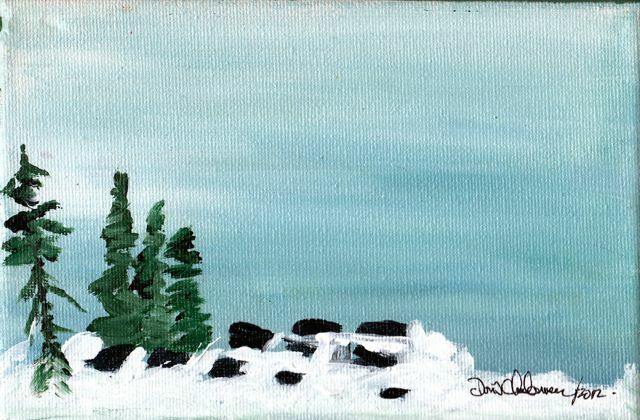 Title: "Spring Snow / Katherine Cove "5x7" acrylic on canvas $85.00 includes shipping and my "Gitche Gumee Songs From the Lake" cd. 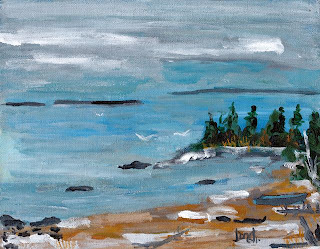 Hi, My name is Don Charbonneau and I live on the Lake Superior Coastline in the little town of Wawa Ontario. Wawa is situated a 140 miles north of Sault Ste. Marie on the Trans Canada Highway. I'm a full time artist as well as a songwriter.I'm always working on new projects. 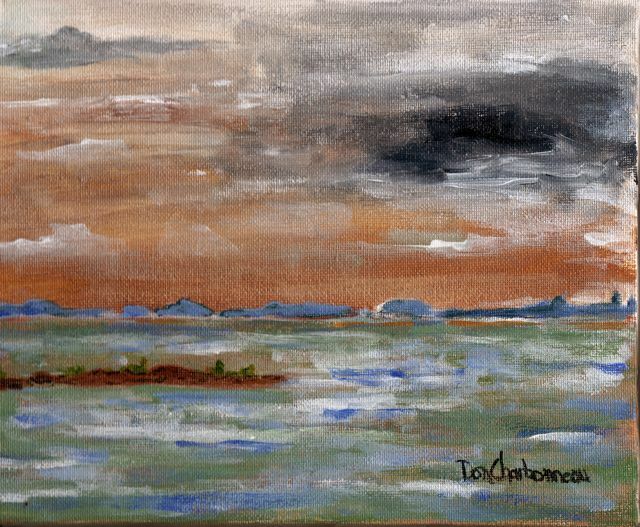 You can check my website www.doncharbonneau.com for some of the things I'm working on and where to find me. During the summer months I operate a wilderness fishing guide service and get to spend a lot of time on the water. I sketch and take photos which I use to create some of the artwork you'll see on this blog. 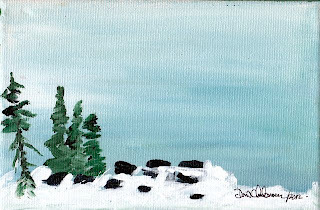 I find a lot of inspiration for my art and music in this incredible Northern Ontario landscape. Come and visit and please drop me a line if interested in anything you see here.